January, the month of new beginnings, saw lots of activities by Indian brands on social media as brands rolled out new campaigns to engage with their audience. 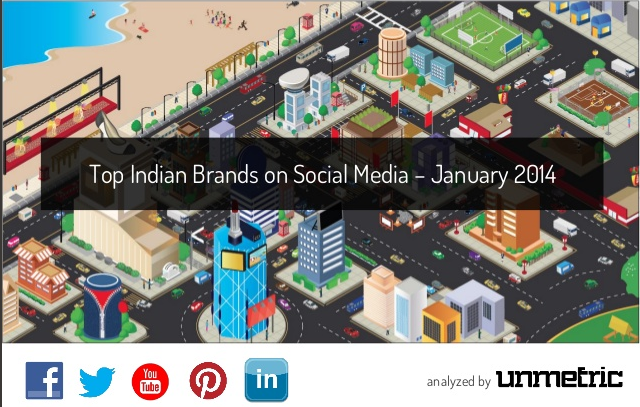 Unmetric takes a look at some of the most engaging campaigns on the Indian social media scene. On Facebook, ICICI Bank’s #TabBanking campaign about its new feature, which enables one to easily open a bank account within a day, resonated well with its fans on Facebook, while Samsung Mobile India’s #EveryDayGrand contest created a lot of buzz for the brand. On Twitter, Tata Nano stole the show with its #CelebrateCityness contest which saw high levels of engagement among its followers, while IndiGo’s kept its followers busy with its #6efridayquiz. On YouTube, Myntra’s video on its mega sale evinced so much interest that it was viewed more than a million times in January, while Samsung’s Galaxy Grand 2 TVC, which was uploaded on the 28th January, was viewed more than 624,000 times in just 3 days. Check out the report below for a more detailed analysis.